Life in the lower tier of the class system has never been thought of as easy. Finding ways to make ends meet is a daily struggle that many go through. Just wondering if your electricity will be working when you wake can inhabit the mind. Such is the case in Emily Schwend's subtly beautiful Utility, presented by The Amoralists. 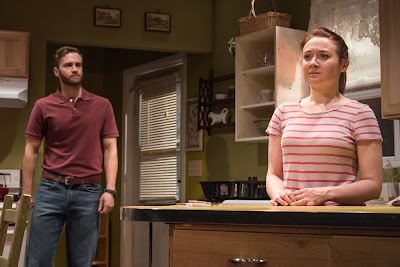 Set in a small town in Texas, Utility is a slice of life play that follows Amber as she tries to keep her head above water by doing whatever it takes to make ends meet. We watch the rekindling relationship of Amber and Chris as they prepare the birthday of Amber's daughter. Though Chris shows his love and devotion, his inability to contribute and immaturity causes the electricity to be turned off mere hours before the birthday party begins. On the journey, we meet Amber's mother who means well but only does the bare bones to assist her daughter and Jim, Chris’ brother who has a romantic tension with Amber. Utility is a play that is all about subtleties. Rather than establishing a bleak, heavy-handed plot, Schwend allows her story to unravel naturally. We're constantly waiting for something to happen but hey, that's life. Schwend's style is reminiscent of Annie Baker. While the play isn't a three hour opus, her drama plays upon the silences and beats without dialogue. And when you have a masterful sound design to fill the silent voids, the dynamic is even more powerful. As a whole, the script is near perfect. The only troublesome bit was the opening. The prologue-esque scene was the only scene to take place outside of the house and a significant amount of time prior to the next scene. Its heavy in exposition and the information learned could easily be incorporated into later scenes. While it does set up the relationship between Chris and Amber, it doesn’t quite work as well as the rest of the play. You almost wish the first scene didn’t exist. Amber is a complex character. And a striking one at that. Amber knows her place in society but tries her best to allow the stress to eat at her. She is all about keeping a façade for both her children and her friends. With so many layers, Vanessa Vache had much to work with. And she was brilliant. The gravitas in her performance was authentic. Amber carried the load for her family and Vache carries the load of the production. Vache is one to keep an eye on. The deep-voiced, big-souled Jim is a character we don’t learn much about. Alex Grubbs leaves you wanting to know more. Grubbs is endearing. Rather than allowing Jim to be a passing character, Grubbs allows Jim to shine, creating a strong character. On the other side of the familiar spectrum, James Kautz as Chris does the unimaginable. The character of Chris may be a constant let down but Kautz makes you love him. You want to believe that he can change. Even when he lets Amber down again, you’re willing to give him yet another chance. Melissa Hurst as Laura, Amber’s mom, is the quintessential Southern mamma. Hurst gives Laura a comedic bumbling persona. Playing with the subtleties, you can see the struggle Hurst gives Laura. Laura wants the best for her daughter but there’s very little she can do to help. While this play took place primarily in the kitchen, it’s very much a “living room play.” Schwend’s script lives in naturalism. Director Jay Stull did an impeccable job make this play live in reality. And that’s what made Utility so special. Stull guided his company to craft some genuine characters that tugged at your heart. And even with little excitement built into the story, Stull kept this piece engaging. Stull’s design team pulled off a victorious win with a unified design. Leading the pack was the exceptional sound design by Jeanne Travis. And it all started with the outdoor buzzy nature preshow. The soundscape Travis provided lifted the show into reality. Between the appliances in the kitchen to the buzz of the air conditioner, the ambiance was essential. It allowed the audience to hear them in the silences because the moment when the electricity went out, the pure silence was that much more dynamic. Travis’ design proves the importance of sound design. Scenic designer Kate Noll created a small home that was strong in detail. The tiny intricacies were a welcome addition. Even the colors she picked were smart. Costume designer Angela Harner clothed the characters well, giving them life in their assortment of looks. When it came to the lighting design Nicholas Houfek did a pretty solid job. Except when the electricity went out. Even though it is likely there was moonlight, the scenes in the dark just weren’t dark enough. And in a play that lives so naturally, it hurt the overall design. Sure, watching a play in pitch black isn’t reasonable but bringing down the look would have made the scenes even more dynamic. The Amoralists have a winner with Utility. The story is clear and real. And that’s what sets it apart. For the most part, Emily Schwend lays everything out on the kitchen table. But we’ll likely never know who saved the day. The possibilities are boundless. And with one moment of ambiguity, Schwend’s story will leave you wanting to know the answer for a long, long time. Maybe if Schwend writes a sequel, we’ll get a resolution.